Lapland Hotel Sky Ounasvaara is aptly named. Situated on a ridge overlooking Rovaniemi, the hotel offers cutting edge Scandinavian design in a fantastic natural environment. 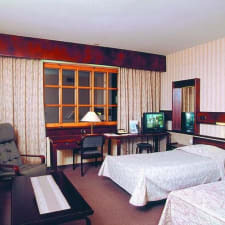 The rooms are simply, but comfortably, furnished and feature hairdryers, tea/coffee stations, telephones and satellite TV’s. The hotel is located beside Ounasvaara ski area, and reception staff can arrange lift tickets, and also other Lapland tours, on request. There is a roof terrace open in summer, and on-site parking is available free of charge. The restaurant has a gorgeous view over the city to the Lapland wilderness beyond, is open for dinner and is known as one of the best restaurants in Finland. Rovaniemi is a convenient entry point into Lapland, with direct trains and flights to Helsinki. The station is three miles from Sky Ounasvaara, while the airport is seven miles. The popular and charming Santa Claus Village, home of Santa himself, is just 6.7 miles away. The great views over the forests were definitely most guest's favourite feature of the hotel. The hotel is situated on a prominent ridge with views as far as the eye can see. Guests especially like the views from the restaurant and roof terrace. Quite a few guests travelled with their young children in winter. Aside from the typical winter activities like tobogganing and building snowmen, which were a great hit, they could also visit Santa Claus Village nearby. About as close to his North Pole base as a family holiday could get. Many guests go out of their way to compliment the staff on the manner they carried out their duties. They were described as especially kind, and always willing to help guests were they could. A couple of guests expressed their disappointment that the main restaurant only opened for dinner. While there were other options for breakfast and lunch, the restaurant has a spectacular view, and guests were quite disappointed they couldn't sit and enjoy their lunch while taking it all in. While some guests clearly like the remote location, those with business in Rovaniemi itself were not happy about having to make a fairly long trek in every day. There is a bus service, but it operates only very limited hours, and taxis are expensive. As with other hotels in the Lapland Hotels Group, Wi-Fi attracts an extra charge. While it isn't excessive, it isn't cheap either, and is charged per device. Most guests are unimpressed that a hotel in Scandinavia can still be charging extra for Wi-Fi, and believe it should be included in the room-rate.